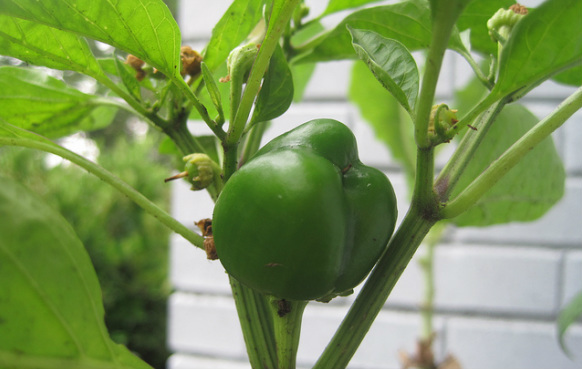 Northern gardens with short cool summers aren't ideal for growing peppers, but it can be done. The trick is doing what you know works and not what gardening experts who have never stepped foot in your area tell you should work. Before I continue, let me say that I have the utmost respect for horticulturists who have devoted their lives to providing gardeners with useful information. Extension offices such as Cornell, the University of Illinois and Clemson University provide valuable resources for gardeners, but there are times when their advice simply may not work in your garden. Growing peppers is one of those times. According to these resources, peppers should be planted 18 to 24 inches apart, but that isn't the most practical or effective way to grow peppers in a northern garden. Because the season is short and temperatures typically remain cool until mid to late summer, peppers do not generally reach the predicted height at maturity. That doesn't mean you can't produce juicy peppers, it just means that you may want to change you growing practices a bit. From my experience, peppers should be planted close enough so the leaves touch at maturity. For the northern gardener this means a mere 8 to 10 inches apart. ­­­­Group them in sets of three to make an attractive planting. Some prefer to plant three pepper plants per five-gallon bucket and place them against the foundation on the southern side of the house. Not only does this ensure that your pepper plants receive enough direct sunlight, the bucket (use black) and foundation serve to draw and retain the sun's heat keeping the soil warm. Buckets with peppers can also be placed on a paved driveway or near stonewall to retain heat and boost growth. Apply water-soluble fertilizer for vegetables every 10 to 14 days to provide the nutrients your pepper plants require. This is especially important if you are growing them in raised beds or buckets as rainwater can leach nutrients from the soil and leave your plants starving for nutrients. Check the soil often and water deeply to saturate the roots when the soil feels dry one inch below the surface. Frequent, shallow watering causes roots to form near the surface of the soil and jeopardizes the health of your pepper plants. Northern gardening can be a challenge, especially with heat-loving plants such as peppers. With a little extra care, you can grow big juicy peppers in your backyard.